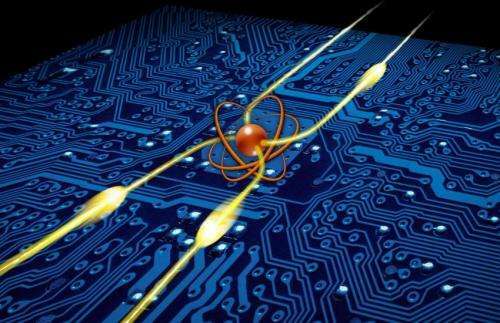 At the core of the device is an atom that can switch between two states. The state is set just by sending a single particle of light – or photon – from the right or the left via an optical fiber. The atom, in response, then reflects or transmits the next incoming photon accordingly. For example, in one state, a photon coming from the right continues on its path to the left, whereas a photon coming from the left is reflected backwards, causing the atomic state to flip. In this reversed state, the atom lets photons coming from the left continue in the same direction, while any photon coming from the right is reflected backwards, flipping the atomic state back again. This atom-based switch is solely operated by single photons – no additional external fields are required. "In a sense, the device acts as the photonic equivalent to electronic transistors, which switch electric currents in response to other electric currents," says Dr. Barak Dayan, head of the Weizmann Institute's Quantum Optics group, including Itay Shomroni, Serge Rosenblum, Yulia Lovsky, Orel Bechler and Gabriel Guendleman of the Chemical Physics Department in the Faculty of Chemistry. The photons are not only the units comprising the flow of information, but also the ones that control the device. This achievement was made possible by the combination of two state-of-the-art technologies. One is the laser cooling and trapping of atoms. The other is the fabrication of chip-based, ultra-high quality miniature optical resonators that couple directly to the optical fibers. Dayan's lab at the Weizmann Institute is one of a handful worldwide that has mastered both these technologies. Dayan: "The road to building quantum computers is still very long, but the device we constructed demonstrates a simple and robust system, which should be applicable to any future architecture of such computers. 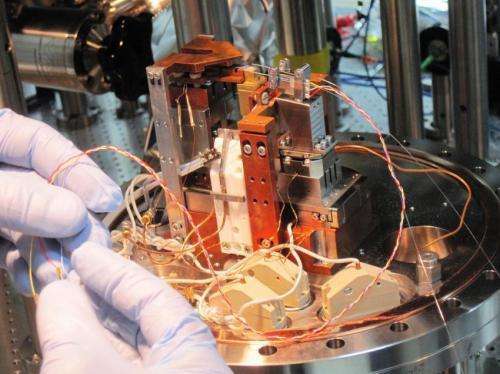 In the current demonstration a single atom functions as a transistor – or a two-way switch – for photons, but in our future experiments, we hope to expand the kinds of devices that work solely on photons, for example new kinds of quantum memory or logic gates." That single atom sets up an oscillation of its own by way of its spin-switching, which is okay if you are only ever playing with a single atom, but in a system this may create issues. What I've always loved about science is that it seems to stand apart from politics and international disputes. It creates conditions where people of all kinds, nationalities, races and believes can work side by side for the same cause, whether they're Iranian, Israeli, Liechtensteiner, Jewish, Buddhist, Vegan, Black or White. It enthralls me to see countless intelligent people unified by their love of science, a common passion to contribute to society and to broaden the knowledge and understanding of the earth we live on and the whole entire universe around it. Here's another reason why your comment makes me mirthless. the endoscope, treatments for horrible diseases such as MS and Gaucher's, devices that detect heart attacks and so, so much more. And if all of the above aren't enough to make you question the logic behind your comment, then please do it for the sake of innocent photonic routers, who don't deserve this hatred. Or at the very least: stop using flash drives. Since they are, apparently, the devil's invention. Also, when the quantum computer gets invented, it is your duty to keep holding on to your outdated computer while the rest of us are having the time of our lives. If the revolting sight of hundreds of dead Palestinians in the Gaza strip, including kids on the beach and in a U.N. protected school, do not seem to convey any concerns on your behalf, it is not so for the majority of the people around the world. Your shallow rhetoric will not have any influence on that. Israelite has to become wiser at choosing their leaders. The international community is watching and the BDS movement is growing. In defence of my position, standing behind Steven Hawking, I find myself in pretty good company. If there is a moment when a moral judgement should outweigh any previous consideration, the destruction of so many innocent lives should be one of them. It is up to every individual to decide when they had enough and, with the help of the social medias, send a clear message.